Situated just a short drive from Ao Nang beach and noted for being one of Krabi’s premier venues, Sofitel Krabi Phokeethra Golf and Spa Resort offers the best in inspired settings. The MICE industry is continually growing and because meetings are an essential part of every company, Sofitel Krabi provides several creative and personalized business experiences, set in the lush surroundings of a tropical forest. 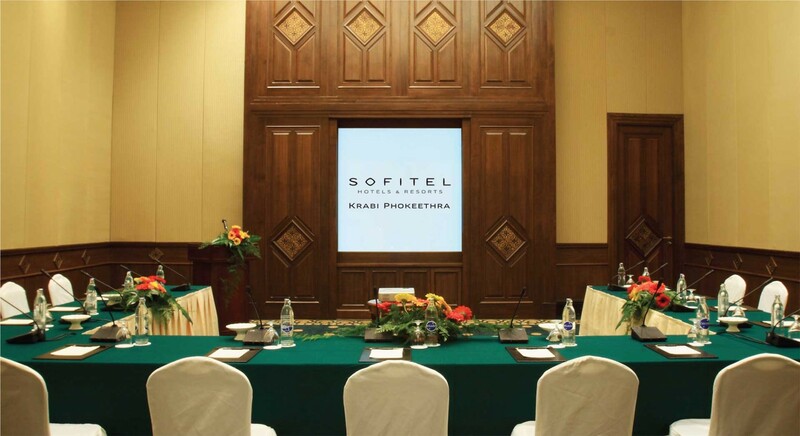 From a grand ballroom and pre-function area with a combined capacity of 500 people, to two meeting rooms great for holding a Krabi corporate meeting, Sofitel Krabi Phokeethra Golf and Spa Resort has some of the best meeting facilities for those looking to host memorable events in Krabi. 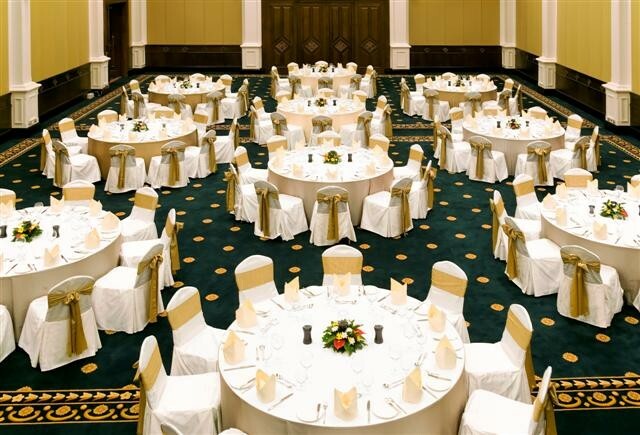 Altogether, the resort offers over 500 square metres of meeting space, making it one of the biggest meeting resorts in the region. MICE Krabi planners will love the Grand Ballroom, another luxurious venue which is known for being the largest pillar-less Grand Ballroom in Krabi, filled with magnificent glittering chandeliers hanging from the high vaulted ceiling. Located on the lobby level of Sofitel Krabi Phokeethra Golf and Spa Resort, it is the perfect setting for glamorous cocktail events, sumptuous wedding receptions, and gala dinners. 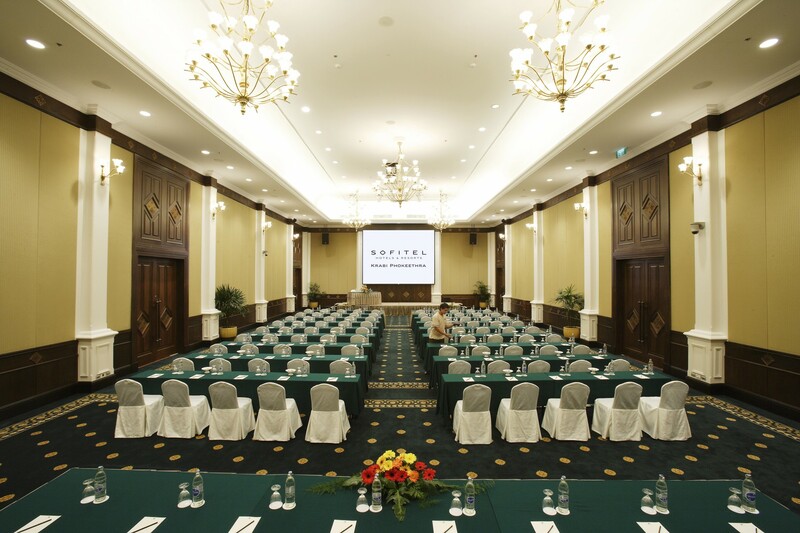 It can hold up to 350 guests and offers all the presentation technology required for a modern Krabi conference meeting. It also provides maximum flexibility, and can be divided into four separate function rooms. To maximise this space to its full advantage, you can choose to have round-table seating for 200 guests; theatre seating for up to 250 guests; or classroom seating for up to 160 guests. Meanwhile, the two other meeting rooms also located on the lobby level – Phokeethra 1 and Phokeethra 2 – are fitted with high-speed internet access, overhead projectors, videoconferencing equipment and copy/printing services making them top-quality places to hold a conference meeting in Krabi. Seating arrangements can be done theatre, classroom, U-shape, boardroom or banquet style. Phokeethra 1 is slightly larger than Phokeethra 2, covering 80 square metres, while the latter only covers 40 square metres. This means for classroom style, Phokeethra 1 can fit up to 40 guests, while Phokeethra 2 can fit a maximum of 20. In theatre style seating, Phokeethra 1 can accommodate 60 guests for events in Krabi, while Phokeethra 2 can fit 30. For U-shape seating, Phokeethra 1 can fit 20 guests, while the smaller Phokeethra 2 can hold 10 guests. Lastly in boardroom style, Phokeethra 1 can host a meeting with 25 guests, while Phokeethra 2 can fit a maximum of 15 guests into the room at one time. At most, Phokeethra 1 and Phokeethra 2 can each fit up to 70 and 30 guests, respectively, in a reception style arrangement. 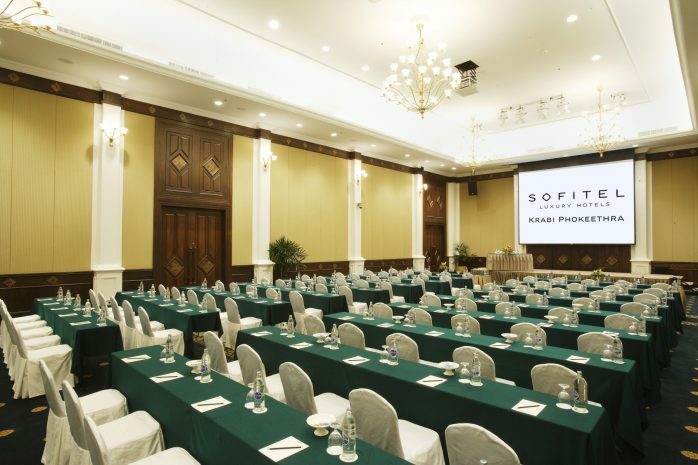 Depending on the size of your meeting, you can discuss with Sofitel Krabi’s experienced meetings and events team which room is better suited to your needs. Meanwhile, dedicated staff are also on-hand to make sure your Krabi meeting goes according to your corporate vision. As one of the region’s top corporate retreats for a meeting in Krabi, Sofitel Krabi Phokeethra Golf and Spa Resort’s passion for excellence is unparalleled. Besides the ballroom and meeting rooms mentioned, there is a dedicated business centre with state-of-the-art equipment and full secretarial services. Wireless connectivity cards for convenient internet access in the lobby, meeting rooms, swimming pool and common areas can also be provided to Krabi corporate meeting guests. Sofitel Krabi also offers six restaurants and bars for gourmet dining and tailor-made catering. The all-day dining restaurant Maya serves contemporary international cuisines, while White Lotus allows diners to discover exotic Indian flavours. Guests can also enjoy classic Italian fare at Venezia, complimented by the resort’s fine selection of wine. Upon request, Sofitel Krabi can provide your guests with the quality fare from any of these world-class dining establishments. Alternatively, any one of these restaurants can be turned into a unique meeting venue in Krabi, for business lunches or teas. Other catering options include Koh Poda Restaurant and Pool Bar, where guests can savour light lunches and blended juices after their conference in Krabi. The Explorer Bar is another catering option and meeting venue where MICE guests can savour tapas-style food and refreshing beverages. As for other resort facilities, Sofitel Krabi Phokeethra Golf and Spa Resort has outstanding amenities that will give your meetings an extra edge. Sofitel Krabi is also home to the largest free-form swimming pool in Thailand, where guests can relax poolside and indulge in refreshments from the Koh Poda Pool Bar sanctuary. Guests can also unwind at So SPA with L’Occitane, and choose from a menu that combines the best of nature with the modernity of French skincare, or work out at the resort’s fully-equipped fitness centre. Then there are the Sofitel Krabi’s premium services which include speedboat for sunset cruises or personalised excursions to nearby tropical islands. Sofitel Krabi Phokeethra Golf and Spa Resort’s strategic location close to Krabi’s tourist town, means your meeting guests can also indulge in the best Krabi has to offer. As the resort is just 25km away from the airport, MICE planners can request for airport pickup to facilitate a smoother meeting or conference. If you’re looking to host your events in Krabi, look no further than Sofitel Krabi Phokeethra Golf and Spa Resort, which is one of the region’s top meeting resorts and corporate retreats for meetings in Krabi.